SB's current obsession is ladybugs. She collects them as pets. Seriously. Where does she find them? In the house. Everywhere. For some reason our house is a HUGE ladybug magnet and they get in despite our quarterly bug control guy spraying the house. But ladybugs are good luck, so I don't mind too much. So the other day SB pulls out her Halloween pumpkin (we play with them year-round) and starts collecting ladybugs. She makes the a house in her pumpkin with water bottle caps as bedrooms, kitchen, etc. She even names them. One is "Red Red Rose" (everything in her world right now is called Red Rose), one is "Pink Purple Rose" (even though s/he is certainly not pink or purple) and the third is "Pink Red Rose." It's all very cute until the next day when the ladybugs are looking a little slow and one it turned over with its feet clamoring in the air as if to say, "Please get me out of this hot pink pumpkin! I'm playing dead until you let me out!" I told her that ladybugs do not live in Halloween pumpkins and they need more air and food. Plus, I told her, ladybugs do not live a long time. My sweet girl ran to the kitchen and came back with three goldfish crackers and a jar of peanut butter. I told her they do not likely eat goldfish or peanut butter. She went and got a leaf of lettuce. We checked the great and almighty Wikipedia and found out that ladybugs are carnivores and eat aphids. And since I don't keep a stock of aphids in the pantry, I told SB we needed to let the ladybugs go. It was an interesting lesson for us, keeping the ladybugs as pets. I had no idea they were carnivores. And SB learned that no matter how much you want something and give it a cute name - some things are not meant to be pets. 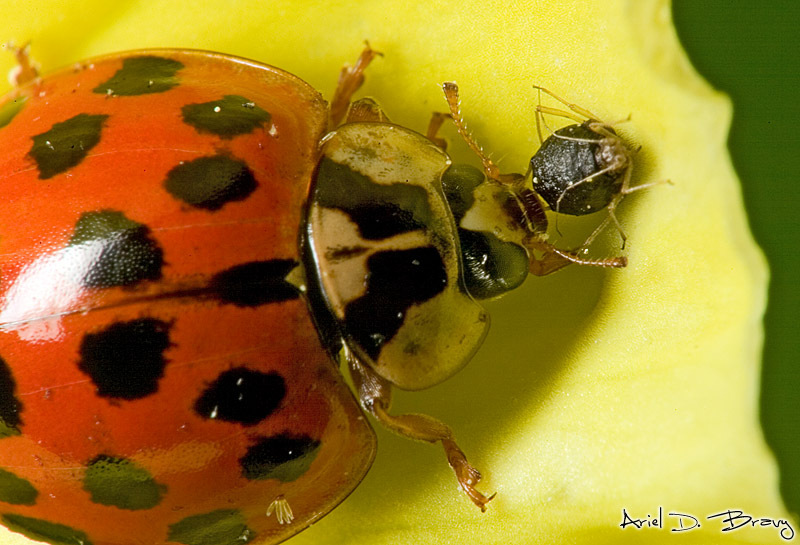 Wow, I didn't know ladybugs were carnivores either... Weird!